Heat oven to 325°F. Line 8-inch square pan with foil, leaving 1 inch of foil overhanging at 2 opposite sides of pan; spray foil with cooking spray. Make and bake brownie mix as directed on box, using water, oil and eggs. Cool. Use foil to lift brownies out of pan; trim edges. Line cookie sheet with waxed paper. Shape baked brownies into 1-inch balls; place on cookie sheet. Freeze until firm; keep refrigerated. In microwavable bowl, microwave chocolate and peanut butter uncovered on High 1 minute, stirring once, until melted and smooth. 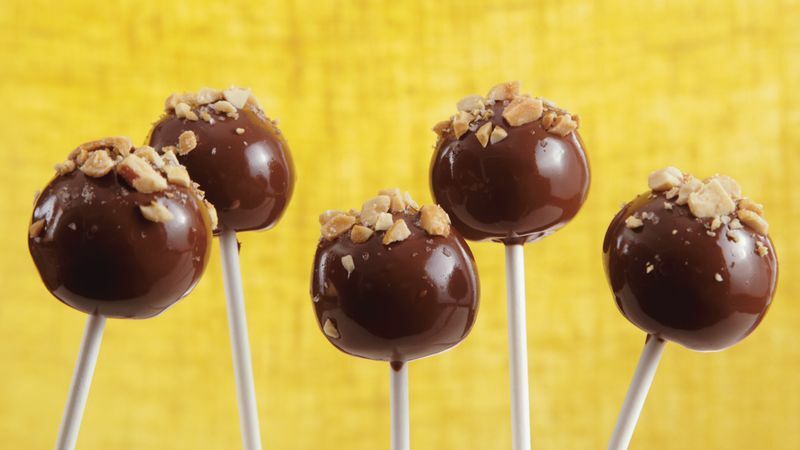 Dip tip of 1 lollipop stick into chocolate mixture and insert stick into 1 brownie ball no more than halfway. Repeat. Return brownie pops to cookie sheet. Refrigerate 5 minutes. Remove from refrigerator a few at a time. Dip each ball into chocolate mixture to cover; tap off excess. Insert opposite end of stick into foam block. Sprinkle tops with peanuts and salt. Refrigerate until set.